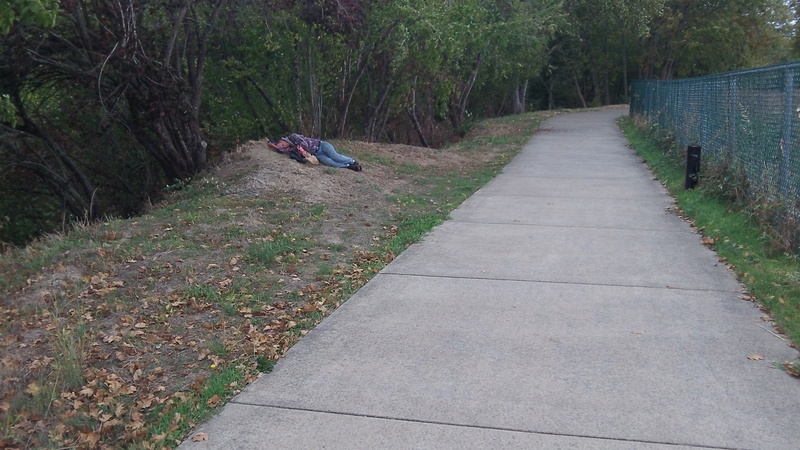 He’s getting some rest alongside the Dave Clark Path. Sooner or later, I thought while riding my riverfront beat on Saturday, efforts to revive Albany’s riverfront will have to deal with the question of how to attract more customers, residents, visitors and even home buyers to a place where the homeless often hang out. The city is about to go out to bid for a lighting system along the riverfront Dave Clark Path, a system that should be installed by the end of the winter. That will help, no doubt, at night. But what about during the daytime when the weather is nice, as it was Saturday morning before the long-awaited arrival of rain? Edgewater Village is trying to sell the first five new homes in the development and is supposed to build, by a deadline next year, the next batch facing the riverfront path. 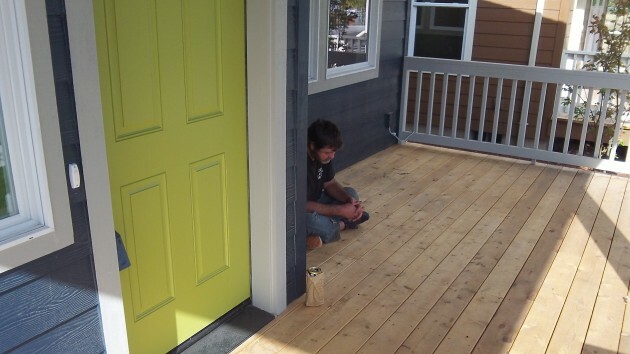 How many potential buyers will overlook a man dozing on the porch of one of the vacant new houses? Or a guy taking a mid-morning siesta across the path from the sites of prospective new homes? Taking a nap is doing no harm, and a tired man without a place to stay has to sleep somewhere. But he doesn’t necessarily contribute to the ambience that buyers of $255,000 houses want. Winter weather will put an end to this sort of thing, probably. But with any luck the warmer seasons will come around again, and then what? The city has put up signs hoping to discourage squatting on the riverbank, but signs are not likely to be enough. More patrols by law enforcement might help, and if that’s impossible for staffing reasons, then trained volunteers might be induced to keep an eye out. A would-be home buyer would have met this unfortunate fellow Saturday. Good news on the lights and homes to be built on the path. I hope they spec the lights to be tall enough to keep vandals from breaking them as has been done with the low ones installed this year. The Albany Community Summit on Homelessness this year is focused on working with landlords to house the chronically homeless. The summit is open to the public: 9 am-noon Wednesday, Nov. 4 at City Hall. In my personal experience, much homelessness is due to drug use and the frequently associated mental issues and then crime associated with such. Simply providing homes would not solve the issue. Neither does, as Tom pointed out, the courts, jail, justice system, mental health organizations, health plans. While they are intended to do well, and many people in the system try to help, it does not work for many people. There is not enough tax money in the system to support what it would take to really deal with the issues, which would include long term residential treatment — years, not 30 days or 90 days or outpatient — for both drug addictions and mental health issues. Simply providing housing, leaves these poor people in the same environment, around the same people, that led them to their condition, and would not help them get better (and then off the streets). But for even that to work, the person must have reached a point where they have decided they want to change. Without that personal commitment, none of what we have in place now, nor long term residential treatment, works. The current system, the courts, the laws, cannot force this decision on the individuals. Providing homes, food, clothing, will not compel them to make the decision. Don’t misunderstand me. I am not against helping, nor providing shelter, food, mental health, what treatment we can for addiction. I am stating that simply proving shelter for all the homeless would not solve the real problem. Try the link in my post below and see that what you assume may not be right. Thanks for the link. I’ll watch the NBC video later today hopefully. I do want to state my statements are based on personal experience. While one statement can not cover all cases, they are more than ignorant assumptions. They are based on observed behavior, observations of folks in need, observations of the current system dealing with them, and unfortunately the misogyny, violence, destruction, imprisonment and this past summer, death that befalls the mentally ill and addicted in our town. I do agree that we should help, but also realize that the individual must 1) choose to want to change and 2) choose to remove him or herself from the circle of friends who will not let them change. Item 2) is the toughest. Just providing housing without these is insufficient. But I will watch the news article and see what Utah has done. Obviously there will always be some people who can’t cope and/or won’t accept help. But there are a lot of people who need the right chance and support. It’s also about a citizenry that is willing to try different ways, especially when the old ways are not working. But surely it’s clear that just doing nothing at all will not work either. The problem is there. Better lighting will allow folks on the trail to see other people. Maybe you should try asking your wife/daughter/female friend if she would walk down a public path that was unlighted near or after dark. Even with other people. Utah, one of the MOST conservative states, believes that true conservatism is deeply entwined with compassion. Something that most conservatives only pay lip service to. Utah took the path of giving housing to the homeless as a way to help them move forward to become self reliant and leave productive lives. Imagine that: Helping people to solve their own problems. It’s a big attempt to solve things. Nothing works 100% but it will be helpful to see if they make a marked change over time. At least they are willing to try.